In today’s global environment, more and more organizations need to reduce their downtime to the minimum possible and look for continuous availability of their systems. Products based on the IBM® Tivoli® Process Automation Engine (TPAE), such as IBM Maximo® Asset Management, Maximo Industry Solutions, and IBM SmartCloud™ Control Desk, often play a role in such environments and thus also have continuous availability requirements. As part of that, it is important to understand the High Availability (HA) and Disaster Recovery (DR) capabilities of IBM SmartCloud Control Desk and IBM Maximo Products, and how to assure that all the components of an HA/DR solution are properly configured and tested to handle outages. By outlining some of the topologies we have tested, and the documentation we created, we hope to demonstrate how robust the IBM SmartCloud Control Desk and IBM Maximo infrastructure can be. 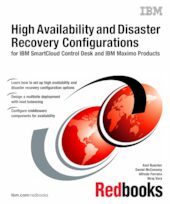 This IBM Redbooks® publication covers alternative topologies for implementing IBM SmartCloud Control Desk and IBM Maximo in High Availability and Disaster Recovery configurations.